At the start of the game each player chooses a hero with a fixed deck of equipment and power cards, as well as a set of upgrades that can be added directly to a player's hand during the game. A semi-randomly created board makes for a different landscape every time the game is played, and randomized sets of encounters and enemies create different challenges for players to face before their time runs out. 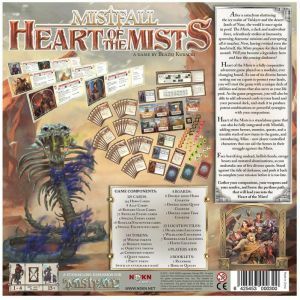 Heart of the Mists introduces more of what made Mistfall great, making it a good entry point for new gamers, as well as a solid expansion for existing fans. 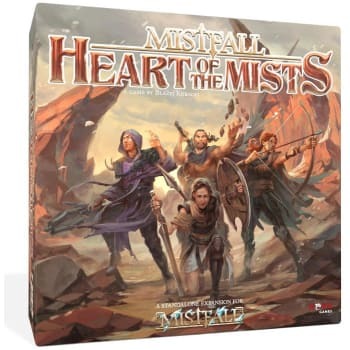 With next to no elements replicated from the base set, Heart of the Mists is the perfect addition to the existing Mistfall set - and a challenging experience both solitaire, as well as with a group of up to three friends. Heart of the Mists is a standalone expansion.